I understand e-reader hate, I really do. Paper books feel right. A nice hefty hardcover, the smooth-coated cover of a stylish trade paperback, even the soft fuzz of a cheap mass market – they all have their appeal. E-readers, on the other hand? They’re plastic things that you plug into a wall. Eh. Where’s the style in that? But I love the Kindle anyway. Love it passionately, in fact. Love it so much that when Laurie emailed me and asked if I wanted to write a guest post about why I love my e-reader, I said, um, yes, please, absolutely, thank you. Tomorrow fast enough for you? No, I love my Kindle because I believe it’s saving publishing. Real publishing. Interesting, innovative, creative, diverse publishing. A little personal history: I worked in publishing for about twenty years, book publishing for the last eleven. Back when I started in publishing, we had a sales force that travelled from one independent bookstore to the next, selling our books. Over the course of the last decade, that sales force dwindled to almost nothing as one independent bookstore after another died. You see, publishers don’t sell books to readers. They sell books to bookstores. At this point, that means they sell books to the Barnes & Noble book buyer. The B&N buyer buys for every B&N in the country: that one person makes or breaks a book. If, God forbid, the buyer says, eh, not interested, then a publisher cannot sell enough copies of the book to make it worthwhile to print. You think that you choose what to read? No. You choose from the options that the B&N book buyer is willing to provide to you. The thing is, as a person earning a living in publishing, I was grateful to B&N. Printing books is a ridiculous business. A few hugely successful titles support dozens of titles that lose money for the publisher. Those losses were a given when I started in publishing. Recently, though, more books broke even because B&N (and Borders) could place such large orders. So, yay for B&N! But in other areas of publishing, where shelf space got scarcer and publishers had to fight to get their books on the shelves and a book that didn’t take off in its first month was a flop and had to get remaindered to make room for the next book in the pipeline? Yeah, things aren’t so pretty there. E-readers change all that. E-readers mean that little presses can spring up out of nowhere to publish quirky little books that a mainstream publisher could never afford to take a chance on. E-readers mean that independent voices, titles that cross genres, stories that are fundamentally different than anything you’ve ever read, titles that might take months or even years to find a slow following – those titles have a chance. You can read those books if you want to. In the B&N-owned print world, you can’t, because they will never be published. So yes, at the moment, that means that Amazon is one huge slush pile. A lot of those independent publications are currently terrible. But that’s because we’re in a period of transition. The way we shop for books is changing, and will change even more. A decade from now, an acquisition editor is never going to have to say, “I love it, but I don’t know how I’d sell it,” and yes, I said that more than once during my career. I originally posted a comment on Meghan's anti-Nook rant, and what I said there was that watching the independent bookstores die was heartbreaking, but that watching the independent e-publishers rise is like seeing the phoenix reborn. Thank you for the post - and to be honest, I also really, really appreciate that you are an e-pubbing advocate who can admit that Amazon's Kindle book store has become a slush pile. It doesn't mean that e-pubbing or even self-pubbing is doomed, just that it still has a ways to go. I definitely think e-books are a boon to authors, publishers, readers, and yet-to-be-converted readers. My grandmother even said recently that people have been telling her for years that she should get a Kindle, since she's such an avid reader, but she doesn't see the point of a device that only does one thing. Had a long talk with her over Thanksgiving about the Kindle Fire and I think she's *thisclose* to saying yes. And with e-book apps available on pretty much every platform, I think more people are buying in to the idea of reading books digitally. I have the Kindle fire and I have to say, I don't love it. I don't not love it. It just seems like... not a Kindle. It's an odd little beast. Maybe I should post a review. I admit, I mostly read my Kindle books on my iPad these days. But I hope e-readers don't die, mostly because of the cost. 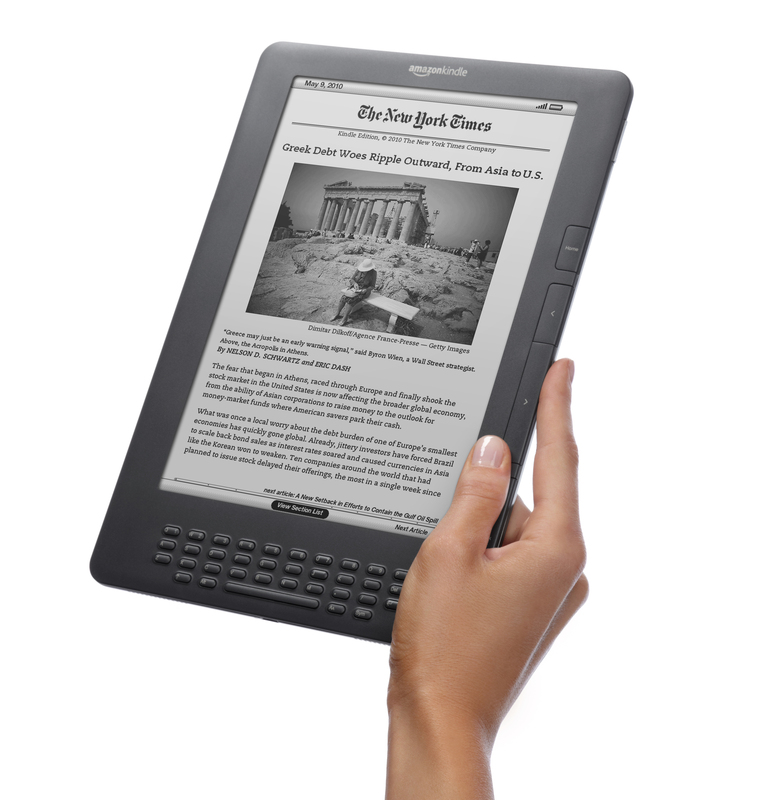 I think e-readers could pretty easily get down to calculator or wrist watch prices, ie, negligible. Laurie pointed out a post from Seanan McGuire on how important print books are to people who can't afford e-readers, and I immediately went off to check the statistics on how many people own televisions (99%). I hope we have a future where handheld technology on which you can read books--whatever it's named--is equally ubiquitous. And Kindle-aholic, yeah, Amazon is definitely a slush pile at the moment. But there are so many sites where people who are passionate about books are writing reviews and making lists and hand-selling--those are the indie bookstores of the future, in my opinion. I worked in a indie bookstore as my first job and the owner let us take books home overnight and read them for free (my ideal job!) so that we could make good recommendations to shoppers. Knowledgeable people behind the counter are what makes a bookstore great: now those people are going to be knowledgeable behind a website, I think. The only thing I'm leery about with tablets vs readers is that my eyes are bad enough as it is. I tried reading on an iPad, but the backlight killed my eyes. I'm heard on the Fire there is a sepia color tone you can set so that it's not as harsh on the eyes to read. I love the e-ink though on my Kindle (I can read for hours with no issues) so it would be hard to give that up. I love my Kindle, and don't have any intention of buying anything else at the moment. As both a new author and a seasoned reader, I'm very interested in seeing what happens with the publishing industry over the next few years. I'd like to see some major changes in how marketing and advertising works, because that's how consumers often choose products, and I think it might help us weed through the current slush pile. I'd also love to see some e-tailers crop up in brick and mortar stores, maybe like little redbox rental booths or older video stores were, only as sellers. It would be great to go to a store and load up your e-reader with a standard format of e-book, just like we can with standard music and movies. I think we will get there (there being somewhere beneficial for everyone), but it's going to take time. The digital format offers great things for both the publishers and the consumer, and it doesn't mean that bound books need to vanish. It's not a competition, it's a growth. With Kindle on the iPad, you can set the background to sepia, too. And I just checked and you can do the same in iBooks. I actually started using my iPad instead of my Kindle because of the convenience of having email right there--I could email myself files and immediately open them in Kindle, which was handy for revisions. Wyndes - good to know, thanks! I have a media player (which I think is the name of a small, cheap tablet that can't go online) and it has a e-reader on it. As a fluke, I loaded it with books I found for free online and tried it out on a road trip. It took some time to get used to and I don't read as fast on it as I do with a real book but I'm not anti-ebooks. I remember hearing someone talking about how when the automobile came out, people railed against it and despite its good points, they were sticking with the horse and buggy, despite horses dying of exhaustion and other problems. Although, the car is the main form of transportation, horses are still here and being ridden and loved. My point is this: yes, ebooks will never be as satifactory as books are but with ebooks, less pressure is on publishing commpanys (like horses) and we're able to still have with being seen as a "luddite" or "environmentally insensitive.